I recently made a few synthetic phonics worksheets from each of my workbooks available for free, so people can try them out with their learner(s) before deciding whether to buy the relevant workbook. 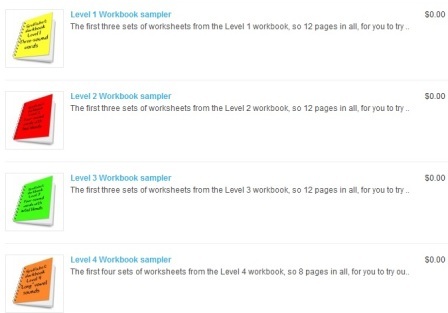 These worksheets are all under "Free stuff" in this site's shop. The worksheets should always be done with supervision, not unsupervised, to ensure that the learner says every sound as she/he writes it, and that mistakes are immediately corrected, and not memorised. In the Level 1-3 worksheets, the support person's job is to say the words slowly (if you're not sure of one, look on the next page), and run their finger across the word on the page as they produce each sound. The support person should not break the word up into sounds for the learner – that's the learner's job. Once they have identified the sound, their job is to choose the correct spelling from the top of the page and write it into the word, with sounds practised in all word positions before they are required to write whole words. Because learners are saying each sound as they write its letter, their brains get maximum sensory information to connect these sounds and letters – from their eyes, hand (as they write), mouth (as they say the sound) and ears (by listening to themselves). This is called multi-sensory teaching, and we know it works. In the Level 4-8 workbooks, more spelling variations are introduced and the learner's job is to copy words, fill gaps and then write whole words by sounding them out, always saying each sound as they write. I hope you find these free synthetic phonics worksheets useful, and that they help you decide whether to proceed to the whole workbook. This entry was posted in blending and segmenting, phonics activities, sound-letter links on July 22, 2013 by alison. I would like to learn how to teach phonics in synthetic phonics rules.